Caitlin here again. Here’s the slideshow (with audio by Jack and I) that I made after our trip. Enjoy! August 31st, 2012. Because this was a Thursday and there was some rumor that my men’s group might try to meet with us by the Mill Pond, just for fun Caitlin dressed up in my clothes so she would be disguised as a man! That got a good laugh out of me and we got some pictures to verify this great impersonation, but none of the other men showed up! September 1, 2012. I slept well and Taboona has maintained her mastery of the picket line so that helps me rest better and longer! We skipped breakfast and headed into Glenwood, stopped at the store had breakfast there and I stocked up on some fresh foods! We made a brief stop at Jerry’s place; I wanted to show Caitlin where we had, first class, hospitality and horse accommodations the last time we went through Glenwood! From there we headed on down the black top towards our final destination. We took one interesting back road just before the Wild Life Refuge but it popped right back out onto the high way after about a mile. We stopped every couple of hours for a rest. Seemed like Taboona was almost frantic to get back to TroutLake! We pulled into Felt Hollow at 3 pm, unhitched and put Taboona in the barn; she rolled in the sand and stayed on her back a long time scratching! 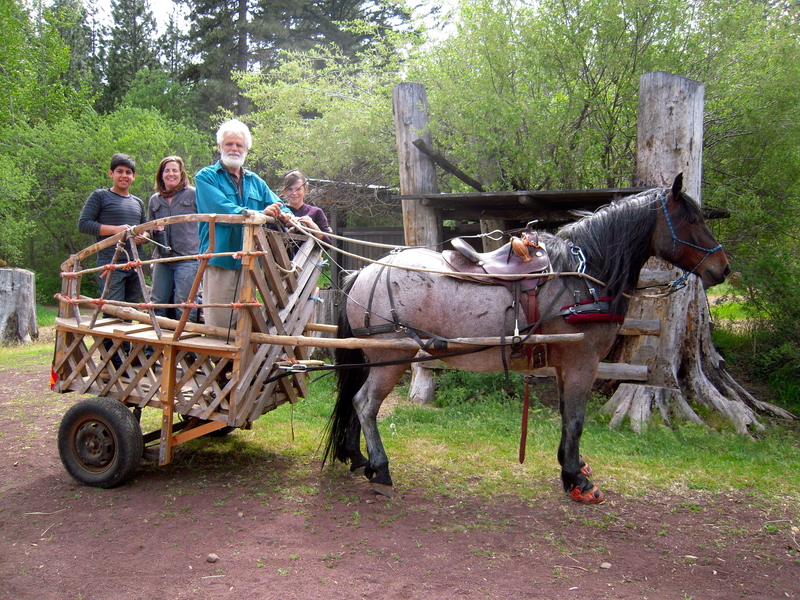 We spent one night at my home then Kya (my daughter) and Caitlin drove my old car up to the Huckleberry fields near Steam Boat Lake we met some other friends there; Rick and Family and Star and Annette from Goldendale. We try to meet every year and pick berries together and have a good time being in the mountains again! Caitlin returned with Star and Annette and Kya and I stayed another two days picking Huckleberries with Rick and Family! I hope you enjoyed hearing about our adventures. I am ending this blog here. It was a great adventure for me! I thank Caitlin for setting up this blog site for me and launching me more into the modern world! For me to be able to spend so much, one on one time, with a wild horse, a Mustang from central Oregon, a captured member of the Stinking water Mountain Herd. I feel much honored and if I could speak for Taboona and what she thinks I know about horses and whether she had as much fun as I did, I am sure she would say; that I had the Cart before the Horse! August 31, 2012. 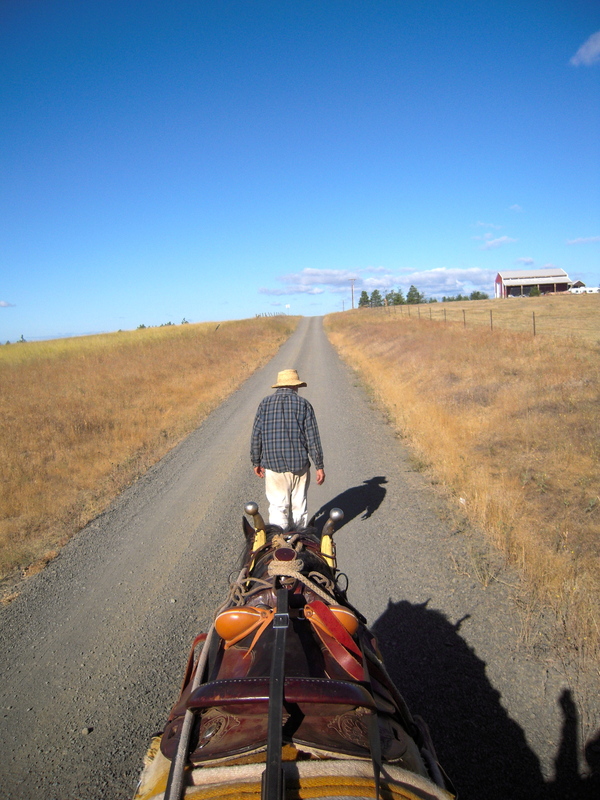 We were on the strait stretch and a gentle climb, so I got comfortable and lay down in the cart on my back with my feet up and I was leisurely telling my story (talking into the a voice recorder) of my walking adventure, of this spring. Caitlin was driving. I was completely involved in my task; my mind was also there in the recent past! Another log truck passed and Taboona headed off the road, fortunately there was a small road for her escape! After that I realized this was not a time for me to relax and from then on Taboona could not handle any more logs trucks. Because she had done so well before I knew this was not really about log trucks but this was the only way she could really get through to us, that she was not happy! I was the stubborn one here and decided the next time a log truck approached, I would stop her and tie her head around in a tight bend, like I had to do on rare occasions when she would not wait for me to get in the cart. So I did that and turned her head toward the road, not away from the road (which may have been better?) I also had Caitlin get out and hold a lead rope off to the ditch side, just in case. By this time the log truck driver was aware that we were having a struggle so he had slowed way down, but when he passed Taboona’s eye she freaked! She reared up and would have gone over back wards if the cart had not been too heavy for her to lift, all the way over. I let go of her head and as soon as she came down she started backing and I was too shell shocked to apply the breaks! The log truck had really slowed down and we almost backed right into him, we missed a collision by inches. I then put the brakes on and got her straitened out! So, OK Taboona was winning, she was now training me. I started to pay attention now. Caitlin let me know in a kind way that tying her head around was not the best training method in this case. 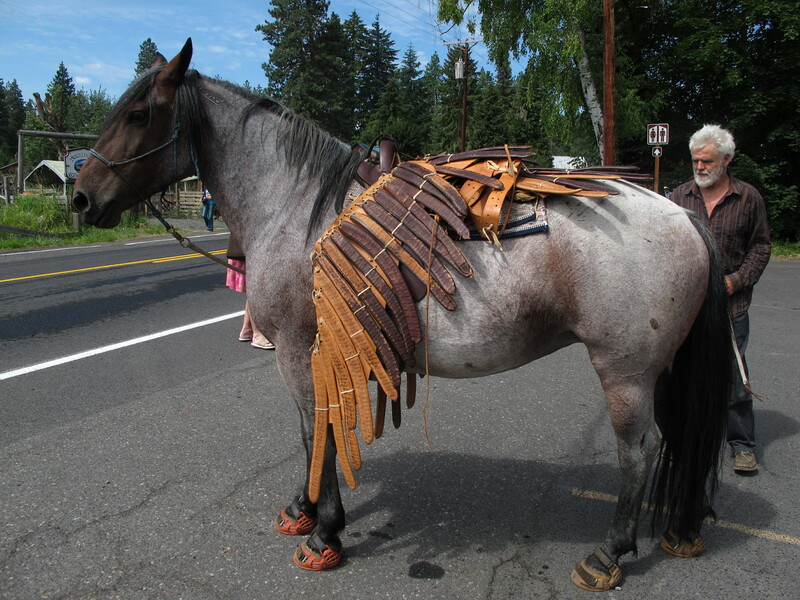 I think what Taboona was needing was more rest; I think we were demanding too much of one horse. Our cart looked like we were escaping the Dust Bowl with everything we owned, well sort of! So these were her rules; we must stop for every on coming log trucks, when that satisfied her, she demanded we stop for every oncoming vehicle or motor cycle or group of motorcycles! We gladly went along with her plan, she was willing to risk her life for it and ours as well, so we gladly obliged! There were also some very positive attributes to her plan, for everyone concerned. We noticed when we stopped, that more often than not the oncoming traffic also stopped! So we got to visit with people and Taboona liked that! One of my favorite lines; a man stopped and looked us over and I could see he wanted to say something so he finely blurted out: “I see you have been shopping.” Caitlin and I got a lot of mileage out of some of these comments! It was kind of true we had pretty things tied all over the cart, not to mention two people and all their gear! We took our time and fortunately there was not a lot of traffic. We eventually made it to the Mill Pond. We decide to camp here despite the no trespassing, to camping sighs that were popping up all over on account of the extreme fire danger! We did our best to keep a low profile, the pond was great for swimming but there was no real good place for Taboona to access, so she did not get to swim, she did however have access to some green grass! August 29, 2012. We left about 8:30 in the morning. We took Fairgrounds Road, past the airport then Knight Road then Fish Hatchery Road, crossed Hill Road then onto Beebe Road then onto Winterstein Road then Calvert Road to the intersection of 142. We took Garrison Road to Counts Road then onto the Glenwood hwy! This was a really great way to cross a big part of the County and kept us off the main hwy and out of a lot of traffic! It seemed like the country side was deserted, probably most everybody worked in town? We made a couple of short stops and met a man on Counts Road that talked about his logging experience and how he had bought a place in British Columbia and could hardly wait to get there but still needed to work for a few more years. Talked about how he was logging the same ground now in some places for the third time! He seemed a little weary of his life but who really knows? We do what we think we have too. We passed my friend, Jan Aslyn’s place and just kept going toward the Canyon. There were no log trucks and that was a blessing! I didn’t heed that little voice that told me to stop and stock up on water, so when we got to the Breaks overlooking the Klickitat Canyon where I wanted to camp, for the night, we could not, so instead we unhitched and took a break. We had to make LydlePark before dark so we allowed ourselves a two hour break. We did try some horse acrobatic while we waited and Caitlin showed me some very “cool” horse stretches, Something Taboona seemed to enjoy! By this time we were a seasoned team and we got Taboona all hitched in about a half hour! That was a record! It was 6:30 pm when we pulled out and there was a beautiful moon rise and still plenty of days light, we thought. 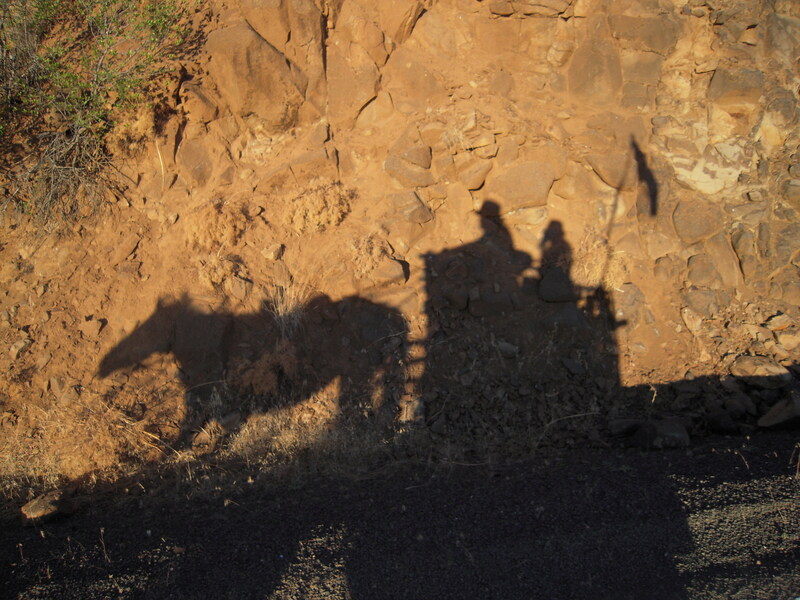 It was on this decent into the KlickitatCanyon where Caitlin took the photo of our shadow on the rock cut bank, the photo I use on my Business Card! Taboona was a lot more relaxed on this trip than our last trip into this Canyon. I was impressed and as we got closer she knew where we were going and picked up the pace! Caitlin and I also had a conversation (and recorded it) of where we were going to bury me, when I finally reach the “end of my rope” so I pointed out the spot and the side of the Canyon where I thought it would be. A place that would be half way between TroutLake and Goldendale! It was getting dark enough to turn on running light, if we had them and we were still three miles from our camp when a County Sheriff pulled up behind us. I said to Caitlin that we were probably in for it now! The Sheriff pulled up along side of us and rolled down his window and said, “That is the coolest thing I have ever seen” and wished us a good evening! Well that was a relief, some how life was a little fuller now! Right about dark we pulled into Lydle Park and a pick up truck was pulling out. 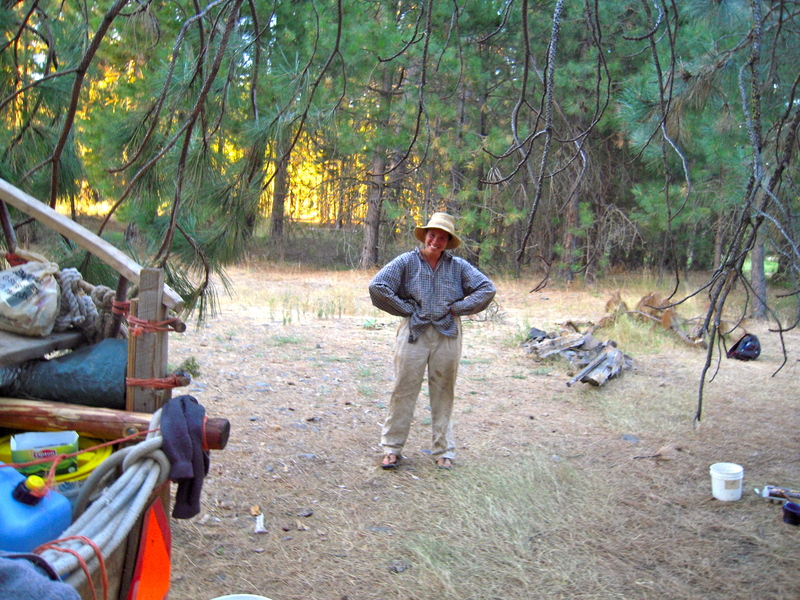 A man got out, he was smiling so we stopped and he said, “You guys really get around with that thing, the last time I saw you were on the other side of Goldendale on Fenton Lane!” We visited a little more then found our camp. But we did enjoy the fact that we were making other people happy as we went along. That made us feel even better about what we were doing for fun anyway! We camped in the same spot we camped the last trip and had a good camp, I cooked up some supper and later played the dulcimer, we were tired but making some good time considering! I slept pretty well but woke up very early to check on Taboona. She was getting so good on the picket line that she survived a potential disaster in the night. I tied her up so she could get to some new feed but the bushes were so thick I did not see the old sheep fence and coiled up barbed wire. Taboona had crossed all this mess several times in the night but did not get tangled up or get a single cut. I knew this was not dumb luck: she was paying attention to her feet and the location of her tether line! I moved her immediately! I don’t sleep well on these trips and I don’t think Taboona does either. This kind of travel is not unlike traveling in a boat, someone has to be on watch! August 31, 2012. We left LydlePark at 10:30 am. We tanked up on water from a spring I noticed the last time I came through here. It was good water! And I have to relate that having several different size plastic buckets have made getting water possible on numerous occasions where a 4 or 5 gallon bucket simply would not fit into the small spring or seep! As we were pulling out of the Canyon going up the steepest part of the hill a pick up truck, with a man and woman in it, stopped, we stopped. The man looked right at Caitlin and said; “I wish I was you, that looks like so much fun.” I thought that was a pretty strong statement but I realize the horse is still very alive in our collective consciousness and is not about to fade away anytime soon! August 19, 2012. Taboona and I headed out and soon passed our favorate sighns! Along Rodgers Road these legitimate signs that actually say; “Feel Free to Hunt Here”! Wow and it is nice land that has been planted in some native vegetation like sage brush and Juniper trees. And the grass is high and there are deer moving around and signs of water! I would like to think that this is the start of some big change in private land holdings and some kind of interfacing with the “have’s and the have not’s” ! Quite a different story from the usual, No Trespassing, You will be prosecuted to the full extent of the law, and other forms of No! This is wind mill country; they dominate the southern sky line. I was thinking as we plugged along how; people make money off the wind but does anyone pay the wind for its efforts? Is the wind interested in supporting hair dryers and keeping cities lit up all night? Has any one thought to ask the wind? Why do I think that this hasn’t occurred to most people? We crossed Fenton Lane on to Saxton Bane and now I realized we were not going to make Ekone Ranch, tonight. The farther we went on Saxton Bane the more interesting the landscape was. We stopped for a rest when we got to Oak Flat Road. It was here I met a young man named Isaac Lewis, who had known Ray and we had some interesting things in common. I mentioned how I had talked to a fellow named Kenny Marvell, a veritable historian of this area! A man who was mentioned to me, by the old timers in Bickleton. We talked about my and Ray’s idea of a Cross County Trail and the old Ell Trail that Kenny mentioned. Isaac mentioned that his brother was doing a documentary film on the old Ell trail! Well all this was very exciting to me and I asked Isaac if we could continue our conversation at a later date. So that was our plan. I started to get some enthusiasm about getting as many people together as I could find, who were interested in a cross County trail! Isaac gave me his business card and drove off to his home and Taboona and I kept going East now on Oak Flat Road. We were going mostly down hill now but just before the bottom we pulled into a small gravel pit. I tied her to a rock and took a rest. I had sent Rick a text giving our location and to my surprise he found us! He checked out the possibility of camping for the night at the bottom of the draw and then went back to his home and made us a couple of roast beef sandwiches! Taboona and I went to the bottom and realize that camping was not probably going to get any better for the night so we made the best use of this wide spot in the road. Rick thought we would be alright and no one would even drive by all night. There was water in the draw and there was a deep pool below the bridge so I slipped in and took a bath. This water was cold and tasted very good too. I packed some up for Taboona and she demanded more and would not drink the spare water we had got from a pond, earlier! She kept pointing her nose to the creek and basically told me to get some more of the good water!